Graphic designer Camille Domangue has an inherent ability of harmonizing seemingly juxtaposing elements in design. Her work exudes a spontaneity even when every shape and and line is carefully placed. All in all, she makes serious art whimsical, and hard angles look natural. This new graduate is constantly seeking new techniques both traditional and non-conventional and her ever-evolving design will have you begging to see what sheâ&#x20AC;&#x2122;s up to next. Tell us a little bit about yourself. I'm a Scorpio and an INFJ personality type and I have been described as intense and loyal. I like hanging out with friends, watching movies, swimming, and reading. My favorite color to wear is black and I love macaroons. Tell us about some of the designs you have created and their success. Most of my work so far is made up of hypothetical projects from school because I just finished my design program at the University of Houston. Some of the projects I've done in school include convenience-store branding, data-visualization posters, and a mutoscope, which is a mechanical flip book. One of my school projects which turned into a reality was for the Blaffer Art Museum. My identity and catalogue design were chosen by the Blaffer Art Museum from among a group of twenty-two designs for the 36th Thesis Exhibition. I've also worked on a couple freelance projects where I've designed wedding logos and various collateral for friends. â&#x20AC;&#x153;GRAPHIC DESIGN IS ABOUT BEING ABLE TO PULL FROM EXPERIENCES AND KNOWLEDGE ABOUT T H E W O R L Dâ&#x20AC;? What is your creative/production process? consuming. And I love reading classic novels. start building the design on the computer. Once the sketches are in the computer, they'll go through multiple rounds of revisions until both the client and I feel like it's finished. and knowledge about the world because the projects out there are so varied and diverse. â&#x20AC;&#x153; T H E U LT I M A T E G O A L W O U L D BE TO FREELANCE WEBSITE DESIGN AND BE ABLE TO CODE MY OWN SITES FROM A L L O V E R T H E W O R L D .â&#x20AC;? How would you describe your style? This has always been hard for me to define. I've been told that my work is "clean with an elegant flare," but I like to think that my style is adaptable to any design situation. It's sort of like a chameleon in that regard. But like most designers, I try and let the project dictate which stylistic direction I should go in. What are your next steps? My next step is to move out of Texas and go travel. I chose to pursue graphic design not only because I thought it would make me happy but because it would one day allow me to live almost anywhere in the world and still be able to work and create to make my living. The ultimate goal would be to freelance website design and be able to code my own sites from all over the world. 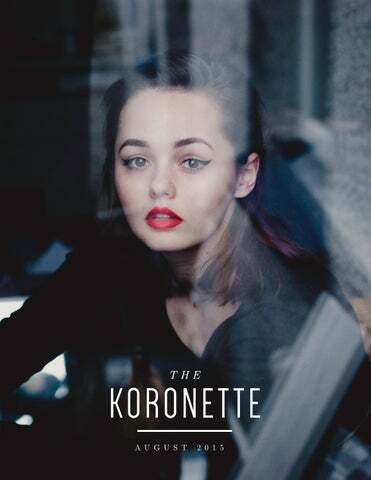 C A R M E L' S TO P 10 T I P S F O R S TA R T I N G YOUR OWN BUSINESS Business and life coach Riza Carmel is sharing her secret weapons to starting a business with Koronette readers for the very first time. Starting something new can feel a bit like you’ve lost your mind, but Carmel has your back. “Happiness isn’t measured by the number of zeros at the end of a paycheck,” she says. “It’s measured by your willingness to take risks and pursue what’s close to your heart.” Follow her tips and you’ll be on your way to doing just that in no time. 1 FIND YOUR TRIBE.​ Surround yourself with like-­minded people. When you’re starting a business, your traditional support system (family, friends, etc.) might not “get” what you’re doing right away. By surrounding yourself with others starting their own businesses, you’ll be able to stay motivated and bravely walk (or blaze) through the path less traveled. 2 WORK WITH A BUSINESS MENTOR OR COACH. Having a mentor or coach will do wonders for you as you take the plunge into entrepreneurship. They’ll support you and keep you accountable, and they’ll stand for your goals and desires even when you may be ready to throw in the towel. They won’t give up on you! 3 DO YOUR HOMEWORK.​ What’s the need you’ll be fulfilling? Who’s your ideal customer or client? Again, this’ll be much easier to tackle if you’ve got your “tribe” and a coach or mentor to work with­­—you don’t have to do it all alone! 4 BE FLEXIBLE. S​ometimes life will throw you a curveball or two, and you may have to modify your original ideas and plans. Your ability to pivot and adapt to the changing needs of your customers, business, and your own life will be crucial to the success of your biz. 5 BE PATIENT. R​emember that success doesn’t happen overnight. It’ll take blood, sweat, and tears, and also some time, before you see desired results or profit. Treat it like a marathon—keep a steady pace, don’t stop, and just keep going. 6 NETWORK. D​on’t be afraid to get out there to meet new people or reconnect with old friends and classmates. The more people you share your new venture with, the more real it will feel and become. And you’ll never know who else may become a part of your tribe and be a source of support for you and your business. 7 “SHAKE IT OFF”. T​here’s a difference between someone giving constructive criticism or feedback and someone who’s quick to say you’re crazy and are going to fail. Again, there are people who just won’t “get” what you’re doing. Remember that “haters gonna hate” and you just need to shake ’em off. The negativity won’t serve you or your business. Keep your eyes on the prize and keep doing you! your business and simply sharing your venture with family and friends are great places to start. Know that your business is a practice and not a perfect—­­there’ll always be something you can improve upon. Simply make the choice to dive in and the rest will follow. 10 “TREAT YO SELF.” ​ Above all, don’t forget to take care of yourself. You are the most valuable asset to your business. Without you, it wouldn’t exist! Starting a business is not easy, and you can find yourself in stressful situations. Be sure to make time for things that bring you joy­­—a massage, a trip to the lake or beach, a few hours curled up with a good book and a glass of wine. These little treats will go a long way in serving you and your business. Wanderlust is captured to perfection in the breathtaking cityscapes of Mike Chuang’s photography. In the mingling of light, movement, and unusual perspective, you’ll find yourself inexplicably drawn toward treasures yet to be explored by the heartbeat of a city come to life. Tell us a little bit about yourself. I’m not sure where to begin . . . I’m currently a junior biology major at Baylor University, and I’m planning on applying to medical school within the next couple years. As a kid, I played lacrosse, swam, and did tae kwon do all throughout high school. I also played piano extensively and competed a lot. I learned to surf when I was little and have loved it ever since. My family is very active, and we would always spend summers down at the shore or traveling. I’m pretty extroverted, and I definitely enjoy making new friends. Connecting with others is never a problem for me. I love admiring everything that goes on in life. Whether it be individuals and their quirks, the places I visit, or the music I get exposed to, I know that admiring things comes second nature to me. Also, coffee. I love coffee. excuse for biting their own style. raw-looking, while my landscape or nature photos tend to be smoother and more moody. person, and general aura I feel from it all. bogged down in trying to develop one certain “style” for myself. What type of cameras do you like to shoot with? that’s it right there. That’s why I shoot. When did you become interested in photography? How has your work changed since then? I picked up a DSLR in junior year of high school, and would just go outside to my neighborhood lake and shoot around, getting a feel for the camera. It was on manual mode when I got it, and I didn’t know how to change that, so I learned how to shoot on full manual, control shutter speed, aperture, and ISO levels all the time. It was a blessing in disguise, because that laid down a very strong foundation and understanding of controlling light and movement right off the bat. My definitive start in really diving into photography as an art began just in December 2014. I was home from school, and spent those cold days walking around Philly and NYC with my camera, taking in everything around me. I’m not sure why I started getting super in to it at that time. It just happened, and I’m super glad it did. My work has definitely evolved since then, and I believe that it is still evolving today. I’m always learning or seeing things in a new light. The way I edit has changed from being a bit grainy to completely clean, but that’s only one concrete example I can think of. Would you consider your photos more planned or spontaneous? Most of my photos are spontaneous. All of my street photography is just being at the right place at the right time and visualizing the moment in my head before it occurs. Of course, when I’m shooting a session with an individual, the photos are planned and staged. I get a lot of candids from those sessions too, though, since I tend to shoot as we’re walking somewhere. What are your next steps? Oh, man. I’m always trying to keep the big picture in mind in my life. I’m planning on applying to medical school within the next two years, so school takes top priority. Photography for me is a passion, but I definitely couldn’t see myself doing it for a living. The types of things I shoot . . . it doesn’t pay bills. I do it because I love it, and that’s about it. PERSONAL BRANDING 101 In an economy that is increasingly entrepreneurial and freelance driven, people are talking more and more about personal branding. These days, people care about the person behind the product just as much as the product or service itself. People relate to people, so this makes perfect sense. But who or what are these personas that we are drawn toward? Is it their style? Could it be their values or behavioral trademarks? Is it their quality of work? It is almost always all of the above, packaged sleekly and cohesively as their personal brand. WHAT IS PERSONAL BRANDING? Personal branding is most clearly explained in the context of job searching. It is a way for people to market themselves and stand out—selling yourself. It tells people what is so great about you—your strengths, your values and work ethic, your writing or design style, and more. It can also encompass your short- and long-term goals, your attitude, aspirations, and experience. Personal brand is generally comprised of two elements: visual brand, which includes a logo, website, resume, blog, photos, etc. ; and brand messaging, which, in short, is everything else. Brand messaging communicates who you are, whereas visual brand highlights what you do. Your visual brand reflects your brand messaging, and vice versa. Think about Tim Gunn. When you hear his name, words such as fashion, style, design, and his famous catchphrase—“Make it work”—come to mind. You also might envision his frameless glasses and perfectly tailored suits. These associations, along with his expertise, are undoubtedly why he landed his role on Project Runway. E V O L V E A S Y O U D O ." benefits. One of the differences between a freelancer and someone who provides services through an agency is that the latter individual can rely on the agencyâ&#x20AC;&#x2122;s brand and reputation to help him or her find clients. The freelancer, however, is on her own. She must sell herself. And one of the most effective selling tools: a strong brand identity. potentially be a bad decision in the long run. Consistency is also important if you are active on any social accounts or blogs. Your content should always have the same voice, images should be styled or edited similarly, and logos should be used appropriately. WHAT DOES YOUR PERSONAL BRAND SAY TO OTHERS? A solidified personal brand is nothing more than the sum of its associations. If you are a photographer, perhaps your name instantly comes to mind when people think of wedding photography or nature photography. If you are a writer, your features in top publications will speak for themselves. If you are a fashion designer, the boutiques and shops your designs are sold in will communicate your caliber. Do not be afraid to associate yourself with other brands to convey your own. Your brand will evolve as you do, and it is important to reflect on the changes occurring in your life to determine how they will affect your brand. Revisit the questions you asked yourself in the beginning to keep things fresh. from how we think of ourselves. just wrote down, circle four or five that best reflect who you are and what you do and focus on them. These will be the core elements of your personal brand. notice your own brand associations. Use your you are. That confidence will speak volumes to prospective employers, clients, and collaborators because when you know what you are selling, they will start buying. We live in an age of background tracks and top-of-the-chart hits, songs we scream along to in the car and tunes we forget as soon as their final note has disintegrated. Grant Nelsonâ&#x20AC;&#x2122;s music demands that languid listeners become more than mere absorbers, challenging them instead to pay riveted attention to his mind-bending sound that captivates and lingers hauntingly in its own wake. Nelsonâ&#x20AC;&#x2122;s music is not simply for amusement; it asks us to entertain the questions and complexities that arise from it. to it when I was merely twelve. me uncontrollably. Hopefully this makes sense. Who or what would you consider your influences? credit to Galimatias, Mr. Carmack, and Skrillex. Those are pretty much my top three of all time. out of creative moods and phases constantly. All I hope is that they want to come back. hearing my music for the first time. to set the right recipe for a mood to create in. What is your creative/production process? I like to be completely isolated while I create. Personally, I create the best when I’m alone. I don’t like to have other people’s energies in the room kind of interfering with what I am making. I know that sounds somewhat selfish, but that’s just how I am. Shut everything out, sit down, and get lost in making a song, as if I were writing a book or something. What are your other hobbies? Not a whole lot! I will skateboard from time to time. It’s something I’ve done my whole life, just no where near as frequently as I’ve done music. What are your next steps? As I mentioned before, the next major step for me is to start branching out into the world of shows and gigs. experimenting with color and self-expression. design throughout college at Baylor University. number of shops in Waco. honed the entrepreneurial skills her father taught her and launched Leslie Medlin || Design House. did not end her journey. expression of confidence, and I don’t believe in the phrase, ‘I can’t pull that off.’” Confidence radiates from knowing you look and feel awesome, regardless of what you’re wearing or what others think. Right on, Leslie. At her core, Leslie is all about bright colors; however, she claims to be going through a minimalistic phase where she is using a neutral color palette and her pieces are highquality and practical. She takes minimalism a step further when she neglects all jewelry (except for her wedding ring) and lets the focus of her outfit be the clothes. “If a shirt has a really great neckline, I don’t want to cover it up with a necklace.” She also plays around with androgyny, throwing on a baseball cap with an otherwise feminine outfit. Her friends would describe her style as “eclectic,” but she just likes to evolve and change with the times. Experimenting, after all, is the only way to learn and be confident in your own true style. 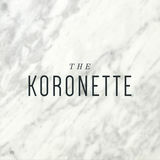 Koronette: Tell us your number-one style rule. COLOR, always the best inspiration. denim on denimâ&#x20AC;&#x201D;then Gap changed all that. your experiences with visual merchandising K: Where do you look for inspiration? the end it is absolutely worth everything. K: Describe your dream job. industry and the furtherment of the Kingdom. business. But they change the world. It has not been easy, especially as of late, but I wouldn't trade it for any job that pays tons of money or gives me fame. Experiencing Craig Reidâ&#x20AC;&#x2122;s photography for the first time is like falling into a living dream. With minor photo manipulation, this "hunter" captures the spontaneity and true nature of fleeting moments with his photographs. The memory of Reidâ&#x20AC;&#x2122;s compositions will have you rushing back to relive the dream again and again. How important is Photoshop to your final images? University down in Cornwall, UK. great lens to just have for every occasion. me and its beauty. I always seem to find my inspiration when I combine my partner and a beautiful backdrop. until my final months at college when I was applying for universities. basketball as a means to keep fit and to blow off some steam. with little influence on what is going on. partner. You can purchase a copy of it from my Blurb account. will be either an emergency or critical-care nurse. finally found a medium that suited me best. it’s the customer’s idea and motivation from the beginning. seeing if I need more or less water on my brush. most of the pieces that meant the most to me. What are your other hobbies? Beside painting, I don’t stick with hobbies for long. Last year it was swimming laps. This year I’m really in to yoga and reading psychology books written from a biblical perspective. How would you describe your style? I call my brand ColoredLightly because my style is vibrant and light. I can’t remember the last time I used black and was satisfied with the outcome. I paint mostly abstract or realistic objects with an abstract element to it. What do you want your viewers to take from your work? I’d like my viewers to think that they could whip out their old paints and create something beautiful. I’m a huge believer that watercoloring does not require expensive supplies. I’ve used the same two eight-dollar palettes of paints for three years! What do you do to stay creative? I used to look at blogs of other artists to get into a creative mood. However, it is a fine line between finding inspiration and becoming consumed with comparison. I love painting with people who have never really painted before. Itâ&#x20AC;&#x2122;s exciting to watch them squirm looking at the blank, white paper. I just start doing my thing and gently remind them that this is about the process, not the product. People are always worried about messing it up. It reminds me to keep watercoloring simple. Also, keeping in close contact with other artists and photographers to talk through ideas and frustrations is so helpful. What are your next steps? I have a few secret projects in the works. I am venturing into acrylic and gouache. Gouache is a bolder, more intensely colorful relative of watercolor. Recently, Iâ&#x20AC;&#x2122;ve been dreaming of creating on huge watercolor canvases. Iâ&#x20AC;&#x2122;m done painting safely on tiny paper. 01 Gather your supplies! Cut your watercolor paper (4x6â&#x20AC;? or 5x7â&#x20AC;? for a standard frame size) and fill a big mason jar with water. Start by spreading a good bit of water across the paper using your brush. This helps prevent the paper from curling up and will help the colors to blend..
02 Start simple. If choosing colors is too much pressure, choose one neutral and one bright color. Gray or tan looks magical with any bold, bright paint. Test your color on scrap paper. The more water on your brush or paper, the lighter the color will be. I like to start in the corners and work toward the middle. Itâ&#x20AC;&#x2122;s less intimidating. 03 Continue to add different colors. Don't be afraid to mix colors on your palette to get the perfect shade. Sometimes mixing with white gives a color a creamy, richer, less-Crayola look. When you are happy with the amount of color, add even more water in random places by dripping on, but not touching, the paper. Then, pick up the paper and tilt it in any direction to allow the colors to mix. This can get messy, but gravity does what no paintbrush could do. It brings disengaged color patches into one beautiful, cohesive abstract piece of art! 04 After your watercolor completely dries, there are many options. Simply frame it for a classic look, or for a trendy calendar, use a black Micron pen to write out the month and its dates.